The Sōtō Sect of Japanese Zen Buddhism originated with and was transmitted in direct, unbroken line from the Chinese Ch'an/Zen monk Tung-shan Liang-chieh (Dongshan Liangjie) of the 9th century. The Rinzai Sect of Japanese Zen Buddhism originated with and was transmitted in direct, unbroken line from the Chinese Ch'an/Zen monk Lin-chi I-hsüan (Linji Yixuan) of the 9th century. The Ōbaku Sect of Japanese Zen Buddhism, however, was introduced and established in Japan by the Chinese Ch'an/Zen monk Yin-yüan Lung Ch'i (Yinyuan Longqi) of the Lin-chi/Rinzai line only during the middle decades of the 17th century. Although the Ōbaku monks were granted shōgunal approval to establich a head temple of their own, the Manpuku-ji in Uji south of Kyōto, their school remained to be operating as but a sub branch of the Kyōto Rinzai Zen temple organization until the very end of the Edo Period - and even longer. Then, entering the Meiji Period, only in 1876 was the Ōbaku branch eventually granted full independence as a "genuine" Buddhist "sect" in its own right. That is indeed the pretty serious, rather controversial subject to be treated on this new webpage. 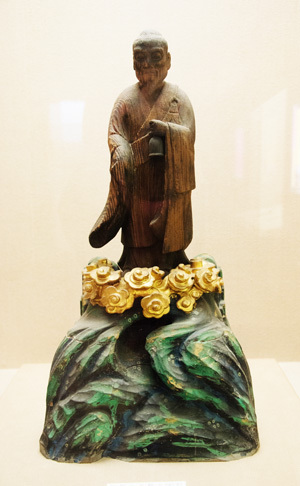 Fuke Zenji sculpture, Matsudo City Museum, Chiba, Japan. Artist & dating unknown. Photo by Ron Nelson, 2015.
during the first half of the 9th century AD. For that reason, quite logically so, Fuke never was, in any way, a "Rinzai Zen monk". That school/branch/lineage & transmission of Ch'an/Zen Buddhist philosophy thought only formulated and eventually established itself after the death of Master Lin-chi/Rinzai - and of Fuke, too, for that matter. Was the so called "Fuke Sect" of the Komusō ever properly, officially - and in actual preserved writing - recognized and approved by the supreme Japanese shōgunal authorities? The answer is, definitely so: "No"! You are now welcome to study a full English translation of the mysterious komusō document commonly referred to as the "Enpō 5 Edict", dated January 11, 1678 - certainly not 1677-12-18! Click in the picture to enlarge. A reproduction of the 1678-1-11 Enpō 5 Oboe memorandum on display in the Komusō Collection, Matsudo City Museum, NW Chiba, Japan. Photo by Ron Nelson, President of The International Shakuhachi Society, Summer, 2015. Left: The 1678-1-11 Enpō 5 Oboe document reprinted in the monumental source collection Koji Ruien, 1880 edition. Right: The 1678-1-11 Enpō 5 Oboe document reprinted in the Koji Ruien, 1938 edition. To the very left in the original, handwritten document above you read these characters: 虚無僧諸派, Komusō shoha, "(To) All Komusō Factions [or, Branches]". In both of the two Koji ruien reprints we see these characters: 普化宗門諸派, Fuke shūmon shoha, "(To) All "Fuke Sect" Factions [or, Branches]". Obviously, both of the Koji ruien reprints of the Oboe must be rejected as "falsifications" compared with the handwritten version of the memorandum shown above them. We can only conclude and respect that there was in fact so far no "Fuke Sect" in existence at the time the document was originally issued/dated, namely: January 11, 1678. Moreover, oboe, 覚, is nothing but a "memorandum", a minor "regulation". It is not a okite-gaki, 掟書, meaning "law", "regulation", "rule", "code", "law", "agreement", "arrangement". Neither is it a hatto, 法度, meaning "law", "ban", "prohibition", "ordinance" . And, it is certainly not a so called kō-nin, 公認, meaning "official recognition", "authorization", "license", "accreditation".